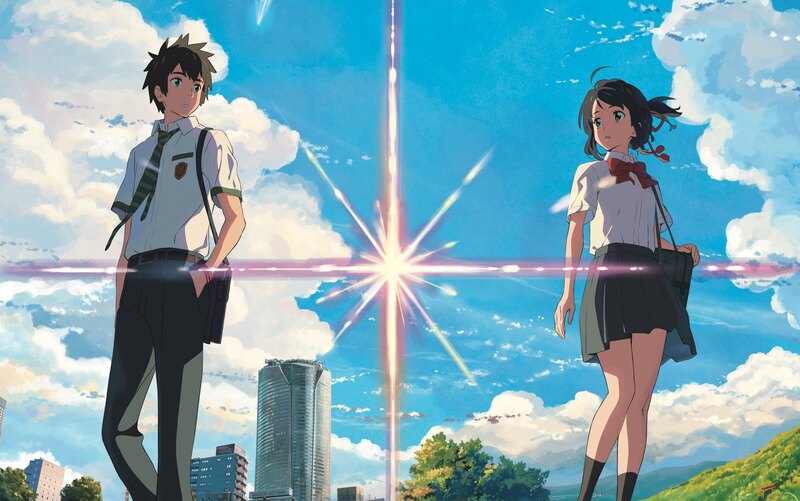 Your Name – The Highest Grossing Anime Film Ever Is Director Makoto Shinkai the next Miyazaki? "I wanted to create a centerpiece of entertainment that everyone could enjoy." This is the mission statement of Director Makoto Shinkai, a rising star in anime who shot into another stratum in 2016. 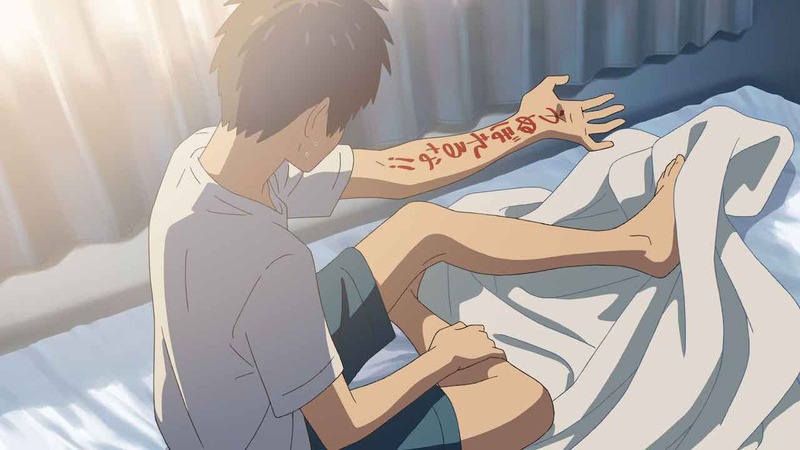 As of this writing, his latest film, Your Name, is the highest-grossing anime feature ever, having just usurped Spirited Away's number one spot, and it's the fourth highest-grossing film overall at Japan's box office. For a sense of how dramatic his jump to the blockbuster club is, Shinkai's last feature, the Garden of Words, opened in just 23 theaters. Now, he's deflecting suggestions from the press that he may be "the next Miyazaki." This, among other reasons, is why we picked this film for our list of Top 20 Anime of all time, despite its recent release. Shinkai asserts he didn't set out to make a more mainstream movie, it's just that he finally had the means and instincts to realize his long ambition of telling universal stories. 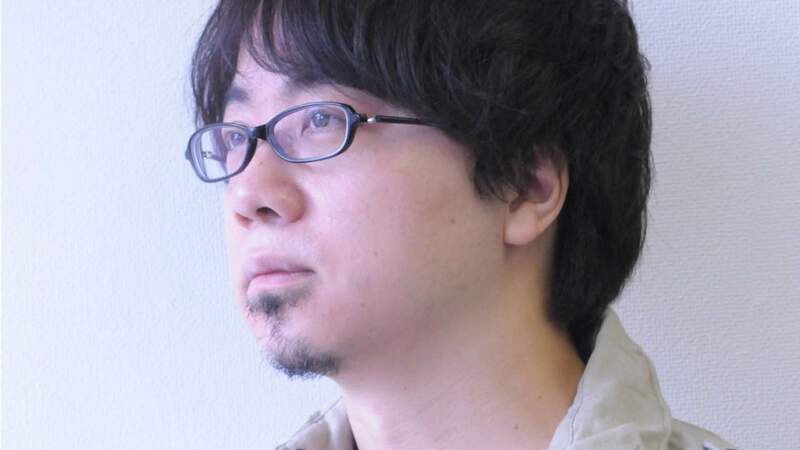 His past films have been received enthusiastically, but they've played more often to an otaku niche. And he acknowledges that before Your Name, he was more concerned with fulfilling his vision as a director than he was with serving the audience's interests. Since he insists his mainstream shift wasn't calculated – that it just worked out this way – then perhaps we're simply seeing Shinkai's destiny as an artist reveal itself. The movie is a most unusual romance. A unique and striking – yet also charmingly accessible – balance of breezy comedy and philosophical rumination. Call it the thinking person's romcom. Spoiler alert: although no major plot points or twists are given away, the next two sections talk about the plot and analyze the themes, so if you don't want to know anything about the story, just look at the pretty images and jump ahead to the "Why Tell This Story?" section. "I came up with this very complex timeline narrative structure [but then] I didn't necessarily feel that understanding the complex structure and timeline was necessary for the audience… I wanted to shift the focus to the relationship between the two main characters [because] understanding the complexities… wasn't most important." In other words, he didn't want Your Name's script to be too preoccupied with big concepts like his past films might've been. The story needed to be more grounded. Funny. Romantic. Less focused on the metaphysical. So he cut material, giving more breathing room to this story of boy meets girl. The movie follows Mitsuha, a high schooler in the small town of Itomori. Bored with quiet country living, she makes an idle wish – that she be reincarnated as a handsome Tokyo boy in the next life. Then, a twist of fate grants her wish sooner than expected: she wakes up in the body of a handsome boy in Tokyo named Taki. The pair keep trading places, seemingly at random, and accept their bizarre circumstances the same way they'd play along with a dream. The couple's "body shock" makes for plenty of humor – at first. Mitsuha's superstitious family casually accepts that she may be dealing with bouts of possession, while Taki's friends raise eyebrows over the country twang he's suddenly picked up. Both kids deal with the awkwardness of having unfamiliar private parts. When the switcheroo keeps happening, though, the two have to accept the reality of their surreal predicament. They attempt to communicate with each other, to varying success, and have just as unpredictable results when trying to meddle in each other's lives. 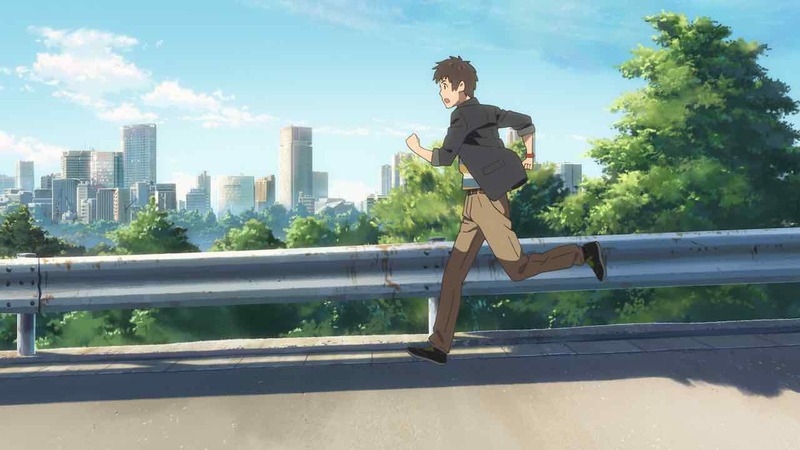 After he's had enough, Taki decides to take a train to Itomori so he can finally meet Mitsuha face to face. Once he reaches the village, though, he discovers a once-in-a-millennium phenomenon has complicated their connection. Without giving too much of the twist away, let's just say the film arcs from the careless fantasy of Freaky Friday to the sci-fi esoterica of Sense8 after Taki's impactful revelation. It's a surprising plus that Your Name invites comparisons to such a broad spread of body-swapping, mind-melding fiction at different turns. Even when venturing into stranger territory, it keeps a brisk pace and a spring in its step – exploring deep thoughts without brooding on them. Shinkai may have avoided making this movie too ponderous, but he still couldn't resist his symbolist's touch. 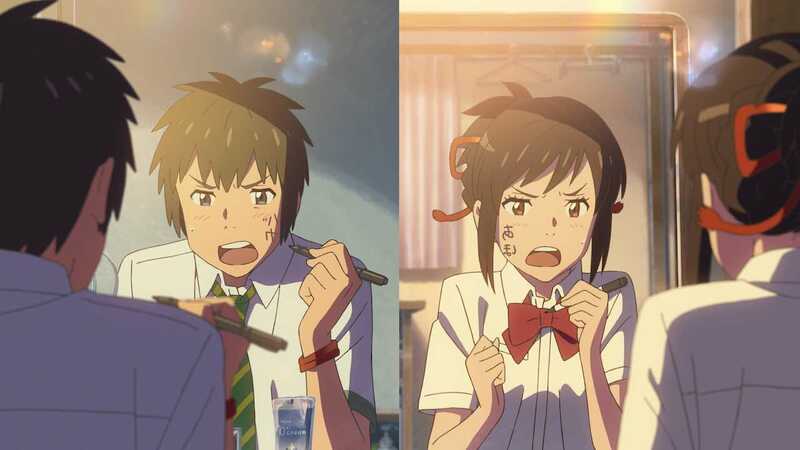 Your Name is full of metaphors, both visual and thematic. Usually, viewers can only speculate at the meaning of such symbolism, but I got to ask the director about what he was going for in person, at a Beverly Hills press junket. His answers revealed the many currents that were bubbling under this cute romance. 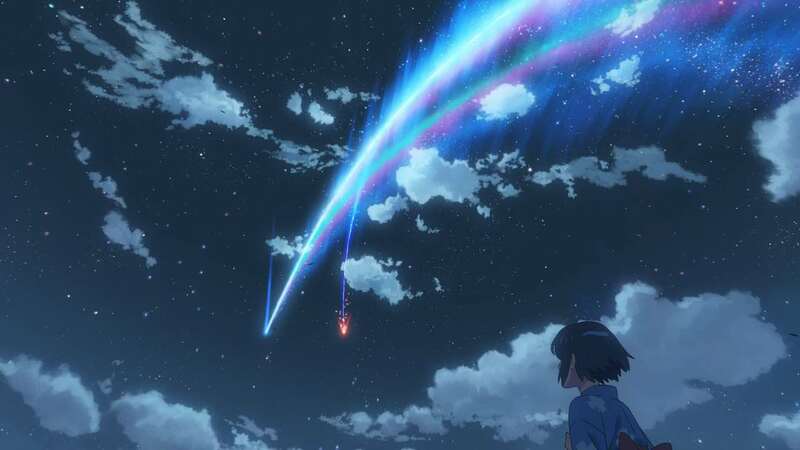 Strings appear all throughout the film, from the ribbons that Mitsuha's family uses in their braiding business to an ominous comet and its tail that resembles string stretching across the sky. The shooting stars falling off it seem more like frayed ends of yarn. At one point, there's even a vision where string connects to a fetus' umbilical cord in the womb. 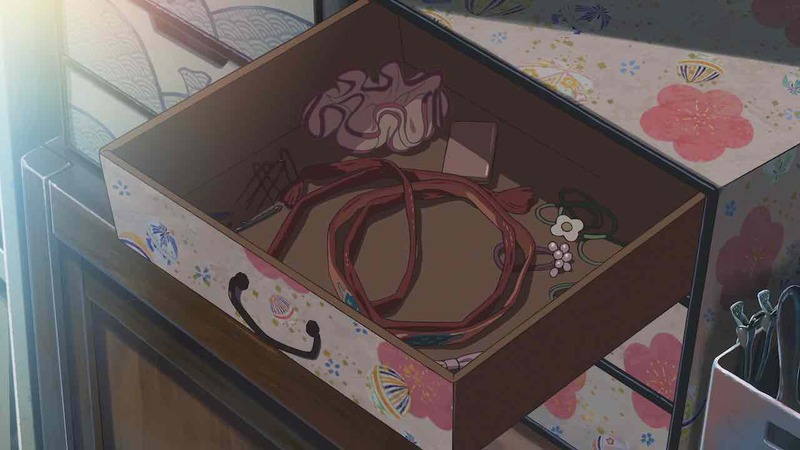 Given all the talk of fate that comes up during Taki and Mitsuha's odd courtship, I suspected the director was making some point about the ties that bind. Turns out, I was warm. "…I wanted a symbol that connected the two of them. In Japan, there is always this talk about the 'red thread of fate' that links two people, and that's where the idea of the thread came from." A little online search found some information on this "red thread." The idea is that the gods tie this string – linking two people together by their pinkies. It may actually have something to do with how an artery directly connects those fingers to the heart. A duo connected by this thread are not necessarily soulmates, but their meeting is still destined for great significance, no matter what twists keep them apart. This romance may tap into primordial currents, but it's still very much a story of our times. 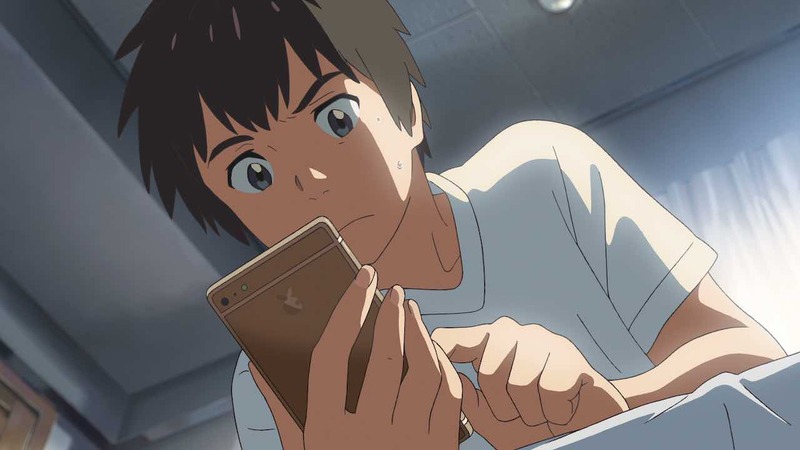 Taki and Mitsuha leave memos in each other's smartphones. And once they collect enough basic info, they of course look each other up online to learn the rest. Even more pointedly, friends start interpreting the odd, secretive behavior of their body-swapping as a cover to hide the potential embarrassment of – what else? – online dating. I suspected that last bit maybe tipped Shinkai's hat a little more obviously than he'd intended. It's easy to read this fantasy romance as an abstraction of how OK Cupid or Match.com work. Total strangers finding love, though they're separated by great distances, and from completely different walks of life, and surely wouldn't have met under any other circumstance. The delay of a proper meeting even seems to mirror the way online correspondences often shake out. Prolonged ping-pong messaging, with highly personal secrets being shared long before either party actually knows the other. "No commentary about online dating is intended." Well then, it's a fun way to read the movie. 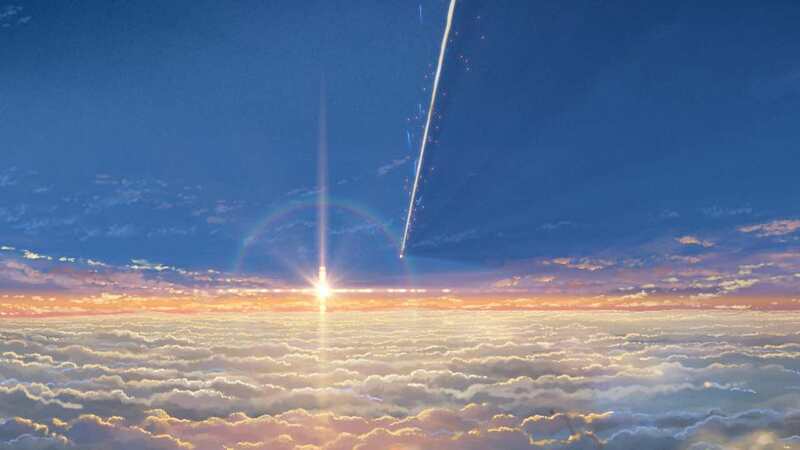 Like any resonant fantasy, Your Name can still reflect the moment of its release in ways its creator didn't consciously intend. "When I did research, that earthquake is said to come approximately once every 1,000 years… so a natural disaster sort of uprooting people from where they live was the theme that I came up with. 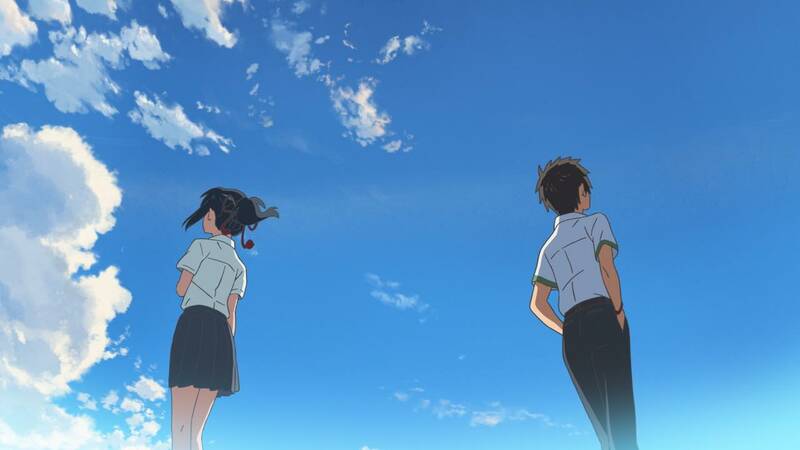 [It] allowed me to discuss the theme of people who must move from what they once called home because of natural disasters…"
A comet coming between Taki and Mitsuha returns to cause hardship once every bunch of lifetimes, too. While he didn't go into more detail, it seems Shinkai was struck in particular by the notion of the past having unexpected and unpreventable influence on even the most modern parts of the present. Stacking conjecture on something aimed as an accessible comedy could be excessive, but not for a film whose director made a point of asking crew and cast about whether they believe in destiny. Of the many choice quotes Shinkai offered at the junket, this one had to be the most telling. Really, it's the stuff of mantras. "If we all knew the reasons for our birth, there'd be no reason to tell stories." Shinkai has a deep interest in the notion of fate, even if he'll plainly state his disbelief in it when asked. He wants Your Name to show the circumstances of one's birth – and specifically the conditions under which we meet a significant other – actually having a world of meaning. The aim is to shoot much higher than typical romance, clearly, and to offer more than just sci-fi escapism. Any comparisons to Hayao Miyazaki really don't hold in regard to Your Name's style. Characters don't have the rosy-cheeked faces, nor does the scenery ask the audience to mediate on its painterly brushstrokes. Shinkai directs CoMix Wave's animators as if leading a live film crew, moving the frame fast, and always in the interest of the plot at hand. Every set has such startling detail (even Taki's bachelor pad shelves are packed with dozens of detailed books), and is "lit" with a care for lighting design unusual in anime. It's so overwhelming to keep up with every intricate composition, in fact, that you quickly forget you're watching animation. One of the few knocks against the film: the portion where Taki and Mitsuha adjust to body swapping can feel like an abbreviated edit of a longer anime series. When their mishaps are shown in a fast montage, escalating to a reveal of the logo (that's accompanied by a song cue, no less), it feels enough like a TV show intro that nobody would be faulted for expecting an ad break. The hurried pace is by design. Shinkai flings concepts out fast to keep the attention of over-stimulated young people who might be distracted by social media. A question at the junket, about whether he'd ever do a TV show, proved more telling about that sensibility, actually. The director is only interested in finite series, needing a sense of closure in his stories, and such focus on endings may explain this rush to get to the finale (as stirring and moving and clever as it is). Shinkai describes Hollywood as a faraway stratosphere, far removed from whatever cult corner he's worked in up until now. And though the director insists this isn't an intentional bid at American moviegoers, his distributors know a crossover hit when they've got one, and they're definitely angling for that audience. The film premiered at Los Angeles' Anime Expo in summer 2016 – before screening in Japan. If the intent wasn't to consciously make a movie that would expand his audience and reach a broader mainstream then – again – perhaps it's just Shinkai's fate. He speaks of making the film as if some current were acting through him. "This movie isn't a response to the film market, rather [it comes] from a feeling that 'I finally feel ready to do this,' which has been with me since the proposal stage." Your Name is a delight with plenty of insights; a unique fantasy that gets laughs and stirs emotions as often as it provokes thought. The director may not seek to be the Next Miyazaki, but he's still made an anime that's accessible like few offerings outside Studio Ghibli manage. Shinkai has shown he's one to pay more attention to as his filmography continues to unfold – and his name ought to be familiar to more than just otaku in America. Because of the reviews and sales of the movie, I was really curious. Among the ton of anime out there, Shinkai Makoto’s work has its own style and originality. Personally, the detailed backgrounds based on real locations in Tokyo moved me, and it made me want to go on a pilgrimage to the locations. Also the music by Rad Wimps (who I spend my high school years listening to) matched the story and emotion well. The story wasn’t predictable, so I think it was one of the reasons behind the movie’s huge success.